It has been a long time since I was on a horse. I rode a few times as a child at commercial stables for birthday parties and occasionally at my Great-Grandparents’ Ranch in Texas. But it has probably been 20 years since my last ride. 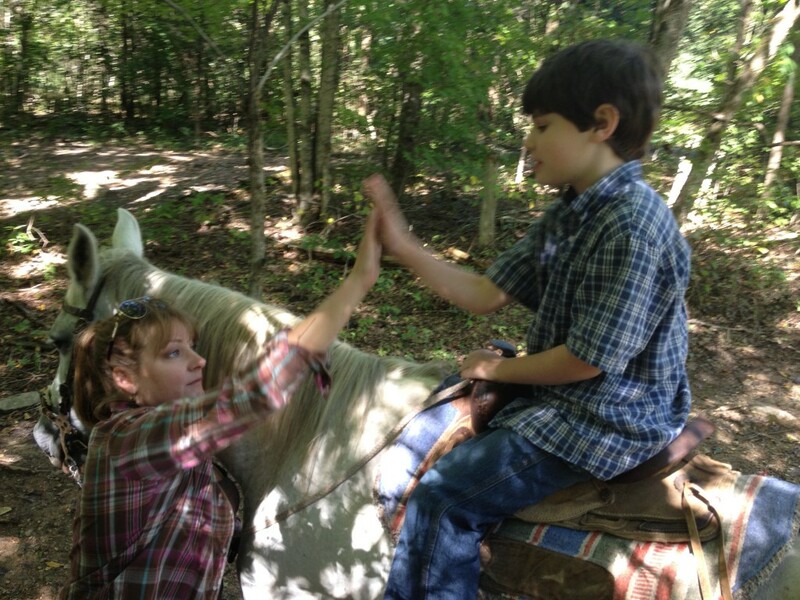 Declan went to horse riding camp and loved it so I thought a trail ride would be a great treat. We headed out on a Wednesday morning when schools were closed for a half day. JuRo stables is very easy to find – about 10 minutes from Providence in Mt Juliet. I felt like we were way out in the country though! I made reservations 2 days in advance and told the stable our riding experience so that they would have the right horses saddled up for our ride. If you plan to visit on the weekend, or while school is out, you may want to call a week ahead to ensure you get the time and day you want. When we arrived we checked in at the tack barn a few minutes early for our 10 AM ride which gave us some time to look around. There are chickens that roam and you can see their coop. There are also lots of farm dogs that like attention. After checking out the small animals we met the horses. A particularly friendly one, Buck, came up to be petted before we started our ride. You can also check out the small shop that sells western themed jewelry, bags and hats. Everything was very reasonably priced. There is a porta-potty that was clean but if you don’t like to use them you should go before you get to the stables. There are no diaper changing facilities. When it is time for your ride your guide will call you over and match you with an appropriate horse. There are large tree stumps to stand on to help you mount. Your guide will ensure you are comfortable in your saddle and adjust the stirrups. If you have not ridden in awhile or if this is your first rodeo, be prepared to be a bit sore for a day or two after the experience, but it is totally worth it! 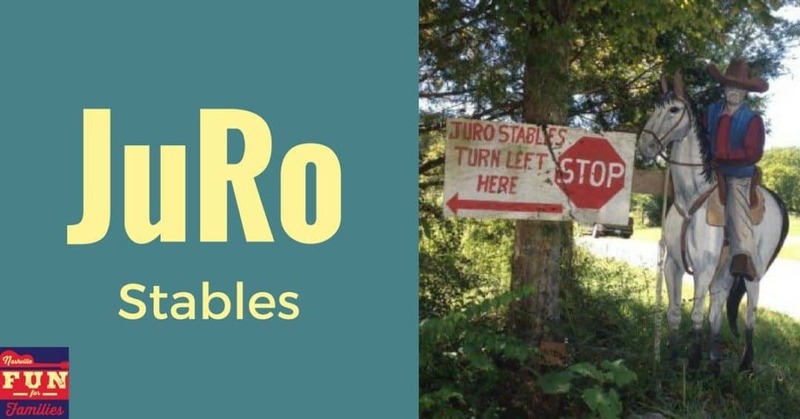 JuRo stables is actually a horse rescue in disguise. We were told by our guide, Kerilynn, that the stable has 46 horses of all breeds and sizes. Some are appropriate for children and others are for more experienced riders. The guides are volunteers and work for tips, so when you go, make sure you have cash to tip your guide. They do a fabulous job! There are 350 acres that are available for riding. We rode through woods, fields and even through creeks. It was much more than your standard trail ride. Declan was nervous at first – he had only ridden when he was being lead by someone. He had never been in full control of a horse. But, within 30 minutes with Kerilynn’s advice and encouragement, he was a pro. Solitare, the horse he rode, was gentle and used to inexperienced riders. At the end of the ride we were sent off on a loop trail and our guide stayed behind. Declan got to lead the way. It was a HUGE confidence booster and he did a great job! A few tips I learned to make your experience more comfortable – make sure to wear long pants. There are some areas that you ride though near some brush and tree branches. Pants will insure you don’t get scratched. As I mentioned I took Declan, who is 7, but I left Tamzin (2) at home. Children can ride with an adult below the age of 4, but I knew that Tamzin would not be still for the hour we were on the horses. Kids 5 and up can ride their own horse. Also, there is a 300 pound weight limit to ride. Cost: Day rates – $25/hour for adults, $20/hour for kids Check here for costs other times of the day.